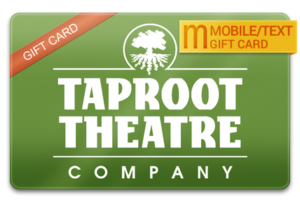 Give the gift of Taproot Theatre! Want to give the gift of exceptional theatre, but you’re not sure a subscription is the best option? Buy a Gift Card* and use it for any Taproot-produced shows in our Jewell Mainstage or Isaac Studio theatres. a project of One Cup Coffee Co. or for Acting Studio classes. We suggest $100 for a pair of tickets to a Jewell Mainstage Theatre production. Gift Cards can be purchased in increments of $25 or $50. Gift Cards can only be redeemed through the Box Office by calling 206.781.9707 (Tue-Sat, noon-5PM) or in-person, they are not currently redeemable online. Choose an E-Gift Card or a M-Gift Card and schedule it to be delivered at any time to your recipient. Is your gift card out of money? Click “Recharge your Card” to add value to/recharge your existing card. Call the Box Office at 206.781.9707. Visit the Box Office at 206.781.9707 at 204 N 85th St.